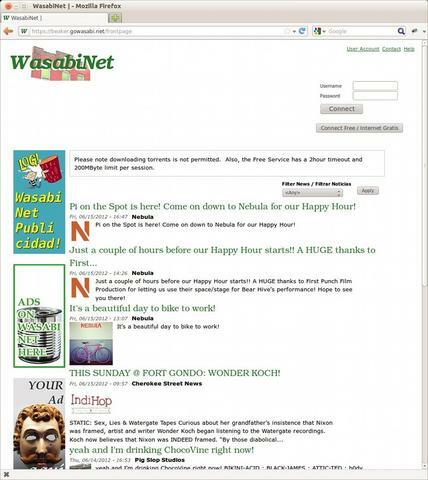 Upon first connecting to any WasabiNet access point, users not already authenticated would have their HTTP sessions intercepted and directed to a web page called the Captive Portal. Similar to that seen on Wifi hotspots in hotels and airports, this Portal features the usual “Go Online” button for free access, along with dynamic content determined by WasabiNet and its associates. This Portal page originates from the Cloud, entirely outside the mesh. This portal presents current news and events relevant to the coverage area (e.g. upcoming shows at 2720 Cherokee), advertising, social media embeds as permitted by the user's browser, and even information (or ads) specific to the particular access point. That is, in addition to conventional methods for developing the Captive Portal for multilingual capacity and cross-browser compatibility (including mobile), the Wifi mesh will also attach additional tags to tell the page information such as the access point's name (equivalent to GPS-style physical location), the user's Wifi signal strength (for determining if the Portal page should load in full, or in minimal form), and the user's MAC address (for identifying repeat visitors, regardless of cookies). In a broad sense, this Captive Portal may be built to behave similarly to location-aware apps popular on smart phones and tablets, but without having to invest in mobile platform-specific development resources. Any mobile device with a wifi antenna and a web browser would display the Portal. In addition, the ability to identify individual users on the mesh based on their device's MAC address permits intelligent and graceful presentation of the Captive Portal to avoid intrusion. That is, users who click past the Portal may be given a time window during which they may roam freely among all access points in their vicinity, w/o being shown the Portal each time their device associates with a new access point. Conversely, users could be intentionally directed back to the Portal (with accompanying status notification) on exceeding a data cap, on detection of banned content, and on other edge cases the network operator may want to address. Finally, just as Captive Portal described above provides fine grained, yet elegant control of free Wifi access, MAC-based bandwidth profiles and automated portal authentication also allow the deployment of faster service tiers using the same access points, e.g. for paid access.